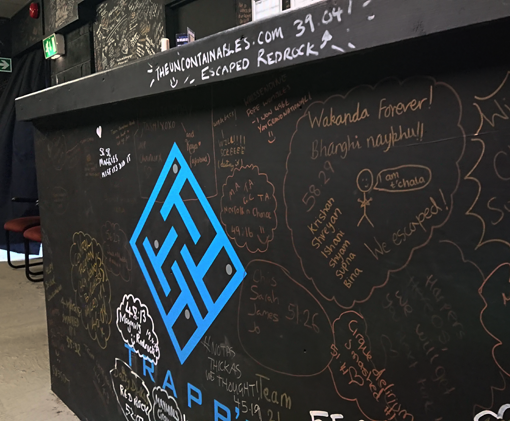 We arrived at a dog-racing track in Peterborough to play two games at the venue's aptly named escape company, Trapp'd. 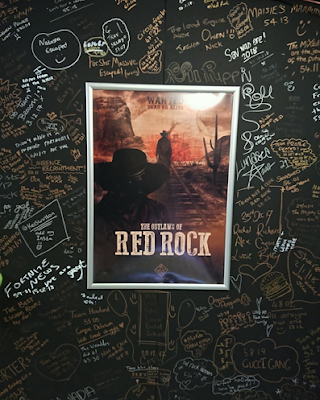 The first of which, The Outlaws of Red Rock, found us trapp'd in Red Rock's Sheriffs jail cell. We were sentenced to death by hanging at dawn after a failed attempt at stealing Red Rock’s rare jewel of unimaginable value. With our mortality’s end drawing closer by the minute and the Sheriff distracted elsewhere having been called out to an ambush shooting just outside of town, we had one final shot of breaking out of the jail cell, making our way to the bank and galloping off into the sunset - with the rare jewel in hand! Megan, the charming receptionist who also doubled up as our games master, met us on arrival. After an enjoyable chat and a run through of the rules we was led blindfolded into the game area. Our first impression was just how easily we could suspend disbelief. Red Rock was dressed to an impeccably high standard, effortlessly realising the stereotypical connotations of the Wild West that we had conjured in our minds before entering this escape. Sand covered floors (shoe covers are provided for those that require them - although we didn’t bother and the sand brushed off easily enough), a convincingly decorated sheriffs office complete with theme-appropriate trinkets, stables and a dusty bank were all present and correct here. With the addition of plenty of authentic wood panelling and our getaway cart - we half expected a gun-toting Clint Eastwood to pop his head around the door. This was a huge space by comparison to other escapes we’ve played. One of the few rooms that would comfortably accommodate its maximum players without feeling overcrowded but translate equally well for smaller groups without the space ever feeling overwhelming. The puzzles often allowed for us to separate and later come together to share our finds, probably our favourite type of room to play. Although in contrast there were some moments requiring the full teams efforts with the game managing to offer a much applauded balance between the two. All the puzzles flowed nicely and tied in effortlessly with its theme. Each riddle progressed us along in the game at an agreeable pace - with a few imaginative and original ideas that we’d yet to encounter elsewhere. Megan was a stellar games master who provided hints when necessary. We felt the games masters' input was judged well on Megan’s part, who intervened appropriately when asked, offering us guided assistance rather than an out-and-out resolve still retaining our sense of achievement when a puzzle was cracked. There was no visual screen here, so throughout the game you’re unaware of your pace or how much time you have remaining, but Megan’s audio clues were extremely clear and concise and worthy a mention given that mumbling games masters or tinny walkie-talkies have been a bit of a bane at other venues in the past. If were being factious our only minor niggle was the ending. As the game was implemented faultlessly with it's exciting selection of puzzles and exceptional pacing throughout, we felt it would have benefited from a bigger fanfare upon cracking the final clue and making our escape. Whether that be with auditory input having the sheriffs returning footsteps hurrying you into one final push to your escape cart to exit, or with some kind of alarm trigger from your jewel robbery would have kept with the rooms dramatic game play to it's very last second. 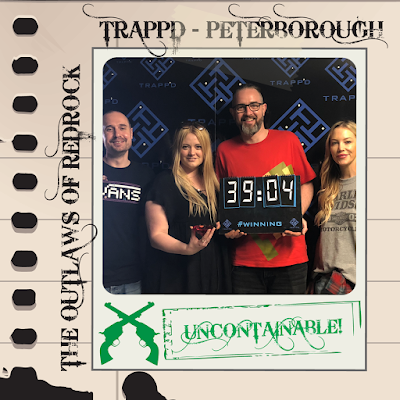 We escaped well in good time at 38 minutes and whilst we are usually pleased to do so well we cant help but wish we were a little more desperados and less rootin’ tootin’ gunslingers here, just to have experienced the excellent surroundings for just that little while longer. 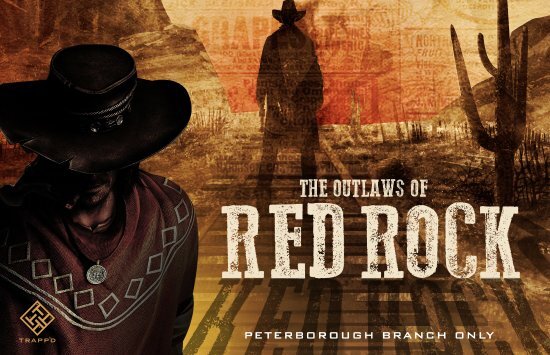 In conclusion, The Outlaw of Red Rock provided a plethora of good, zero of any bad and as our picture shows …plenty of ugly!